The eNotes Blog: Win a Year’s Supply of Bacon From eNotes! Win a Year’s Supply of Bacon From eNotes! Sure, we are pretty fond of Sir Francis around here, but nothing beats a sizzling pan full of the other white meat. In honor of every college student’s favorite food, eNotes is giving away a year’s supply of bacon. That’s right. A YEAR’S SUPPLY OF BACON from BaconFreak will be delivered to your doorstep, and we’ll also throw in a 1-year premium membership to eNotes. eNotes has always helped you with your grades by providing great study guides and a free Q&A forum. 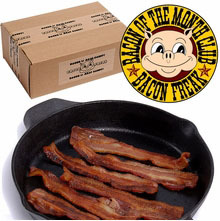 Now we want to help you out with your breakfast by giving away a 12-month subscription to BaconFreak.com’s “Bacon is Meat Candy” Bacon of the Month club. Check out the gloriousness here. Don’t know how to tag? Just type an “@” in your status update, and then type “bring home the bacon.” If you don’t tag us, we can’t see your entry, and the bacon can’t be sizzling in your kitchen! I need @eNotes.com and @bacon freak to help me @bring home the bacon. For free, cuz I have five roommates. And bacon is the breakfast of champions. We’ll randomly select a winner next Friday (September 17)! Good luck!